In Toronto the flooring is one of the first things that a person will notice when entering your home or office. Hardwood flooring can be one of the most important aspects of a home as a lot more home buyers are looking for, when they are considering buying. Flooring isn't just something you walk on, there is more to it. For people passionate about the decor of their home, flooring holds an aesthetic importance. It makes a big difference in the way the home feels. The days of carpeted flooring in your home are over as hardwood is easier to clean and maintain than carpeting. Old worn or dirty carpet can turn away a potential buyer and can also give the home a worn or dilapidated look. There are a number of ways with which you can enhance the otherwise dull looking floor, installing ceramic tiles or linoleum for instance. However, wood flooring is the most preferred choice as it gives an overall aesthetic appeal to the house. Parqueteam Hardwood Flooring offers high quality hardwood flooring in Toronto, and the rest of The Greater Toronto Area. Check below cities we serve! Our range of flooring services includes fitting of various types of wooden flooring, subfloor preparation & levelling and finishing works such as skirting boards/beading installation, doors/door frame trimming, insulation fitting and damp proofing. Nailing Down solid wood or strip floor - This type of method is used primarily when installing a solid wood floor. This option requires that your home have either plywood or wafer board/OSB on the sub-floor. The name says it all. Nailing gives you a deck-like style floor. Generally speaking, whether you opt for a glued or nailed floor is a matter of personal preference, except for the rare cases when the wood type requires nailing rather than gluing. Using nails to fasten down the flooring is advisable in the case of hardwood with thickness of about 3/4 of an inch. Getting the flooring stapled down in place is just another type of nailing. The advantage of having your floor stapled down is the process is easier and much quicker and is vastly preferred. Gluing Down - This method is most common when installing an engineered strip or plank wood floor over concrete sub-floor. With plywood sub-floors glue down installation can also be quieter than a staple down install with less creaking when the floors expand and contract with time. 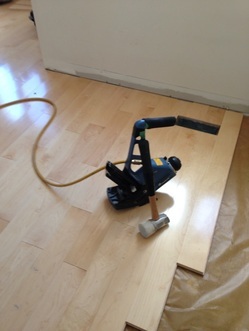 Gluing down with a professional Wood floor adhesive can sometimes be the only way of installing hardwood flooring. This will be when we are installing wood floors on concrete or onto subfloors with the possibility of having running pipes below. To be on the safe side we have to do the installation with Wood floor adhesives. This method is appropriate as well for Hardwood floor fitting or deco/pattern floorings. Floating Installation - This method has grown tremendously popular over the last few years. It has become known as one of the most stable and forgiving installation methods available. The reason this installation method is so stable, is because it is not attached to the sub-floor whatsoever. In this type of Wood floor fitting, popular with engineered wood flooring and laminate flooring, the floors planks can fit/click together directly without gluing or nailing. That type of floor fitting, not bonded directly to the subfloor, allows installation of specific types of underlay - for sound insulation or dampening insulation. Each plank connects to the others through grooves and tongues, much like the pieces of a jigsaw puzzle. This method allows installation of floors over surfaces that cannot be made perfectly flat.